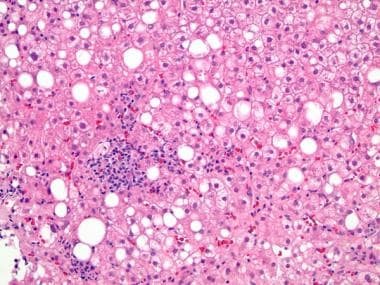 The term nonalcoholic steatohepatitis (NASH) was first coined by Dr. Ludwig 3 decades ago to describe a unique entity characterized by fatty changes with lobular hepatitis in the absence of a history of alcoholism (see the first image below). The main lesions described in that study—namely, steatosis, liver cell injury, and the unique zone 3 “chicken wire” fibrosis (see the second image below)—remain central in establishing the diagnosis. This image shows steatohepatitis with steatosis and predominantly macrovesicular and inflammatory foci, composed predominantly of lymphocytes and Kupffer cells in the hepatic lobules (hematoxylin-eosin stain, 200× magnification). A Masson trichrome stain shows perivenular/pericellular ("chicken wire") fibrosis in nonalcoholic steatohepatitis (NASH) (200× magnification). In recent years, the 2-hit hypothesis has been the subject of debate. In view of the current understanding of the potentially deleterious effects of peripheral and hepatic insulin resistance, multiple hits may be possible. Although the specific pathways leading to inflammation and fibrosis are not clearly pinpointed, evidence supports a role for dysregulated lipid partitioning mediated by insulin resistance and concomitant altered cytokine profiles. Nonalcoholic fatty liver disease (NAFLD) is a multifaceted metabolic disorder that represents a spectrum of disease, ranging from steatosis without specific injury (which is considered relatively benign) to nonalcoholic steatohepatitis (NASH) and to NAFLD-associated cirrhosis, as well as infrequently to hepatocellular carcinoma [5, 7, 10, 15, 16, 17, 18, 19] in the absence of alcohol intake, sometimes necessitating a liver transplant. Nonalcoholic steatohepatitis (NASH) in adults is characterized as a zone 3 injury pattern with lobular-based inflammation. When disproportionately dense portal inflammation is present, concomitant liver disease should be considered, such as viral hepatitis, autoimmune hepatitis, or chronic biliary disease. Portal inflammation may also characterize NASH in the pediatric, rather than the adult, population. Ultrasonography, computed tomography, magnetic resonance scanning and magnetic resonance spectroscopy have been used increasingly for detecting fatty liver. However, liver ultrasonography is perhaps the most popular modality for the diagnosis of nonalcoholic fatty liver disease (NAFLD), mainly because of its lower cost and its wide availability in medical practice. Ultrasonographic findings of "bright" liver, with increased echogenicity in comparison with the kidneys, vascular blurring, and deep attenuation, are suggestive of liver steatosis. The sensitivity and specificity of liver ultrasonography for detecting liver steatosis are 60-94% and 88-95%, respectively. 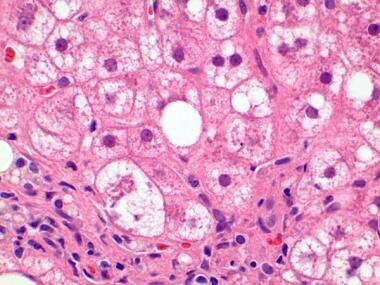 Steatosis is predominantly macrovesicular, with lobular inflammation and ballooned hepatocytes in zone 3 (see the image below). Cirrhosis induced by nonalcoholic steatohepatitis (NASH). Note that some of the histologic features of NASH—such as steatosis, ballooned hepatocytes, and lobular inflammation—may no longer exist ("burnt out" NASH), although the characteristic perivenular/pericellular fibrosis may still be present (Masson trichrome stain, 40× magnification). Patchy microvesicular steatosis is a manifestation of severe mitochondrial dysfunction and is commonly associated with acute fatty liver of pregnancy, alcoholic foamy degeneration, and certain drug toxicities (eg, valproic acid or Reye syndrome). Hepatocellular damage in the form of hepatocytic ballooning is an important finding in NASH. 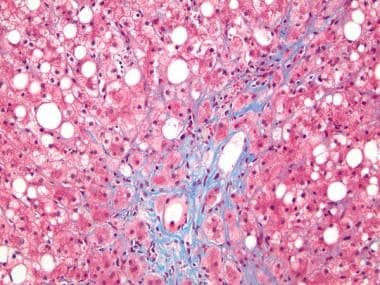 Studies have shown it to be a significant histologic feature for distinguishing progressive nonalcoholic fatty liver disease (NAFLD) from less aggressive forms. Hepatocytic ballooning is characterized by swelling and enlargement of the hepatocytes, resulting in loss of their normal hexagonal shape, along with cytoplasmic alterations that sometimes contain Mallory-Denk bodies (see the following image). Higher magnification shows ballooned hepatocytes that also contain Mallory-Denk bodies (hematoxylin-eosin stain, 600× magnification). The cytoplasm is clumped, rarefied, or finely reticulated, possibly as the result of accumulation of intracellular fluid due to liver cell injury. The nuclei may be enlarged, hyperchromatic, or both. The Mallory-Denk bodies consist of ropy and clumped dense eosinophilic material that can be highlighted by p62 or ubiquitin immunostains. The inflammatory infiltrates are mixed and predominantly mononuclear, including lymphocytes and Kupffer cells (see the images below), or they may have foci of "satellitosis" consisting of aggregates of neutrophils in the immediate vicinity of injured hepatocytes. Higher magnification shows ballooned hepatocytes and surrounding inflammatory cells, including lymphocytes and Kupffer cells (hematoxylin-eosin stain, 600× magnification). 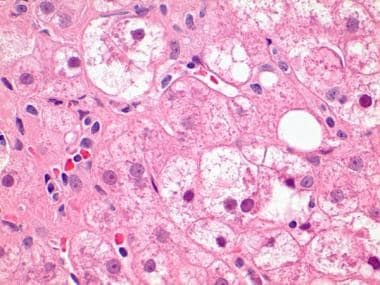 In adult NASH, fibrosis develops over time, initially in the centrilobular location (zone 3) as pericellular/perivenular fibrosis—a pattern referred as "chicken wire" fibrosis—and eventually leading to portal-central bridging fibrosis and cirrhosis (see the image below). 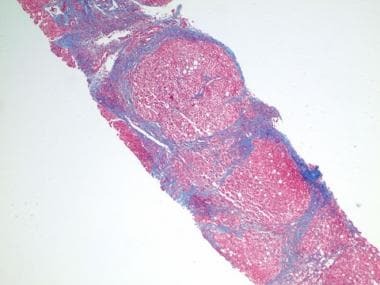 This pattern of fibrosis is well highlighted by trichrome staining as strands of collagen deposits within the sinusoidal spaces and surrounding the hepatocytes. In NASH, hepatocytes may also contain megamitochondria (giant mitochondria), apparent as eosinophilic round or needle-shaped intracytoplasmic inclusions 2 to 10 microns in size. These are swollen mitochondria with multilamellar membranes and paracrystalline inclusions, with loss of cristae on electron microscopy, and may reflect injury or adaptive change of the mitochondria. However, megamitochondria are not specific to NASH and can also be seen in alcoholic steatohepatitis. Other microscopic findings that are common but that are not necessary to establish the diagnosis include acidophil bodies, glycogenated nuclei, pigmented macrophages, and lipogranulomas. Ludwig J, Viggiano TR, McGill DB, Oh BJ. Nonalcoholic steatohepatitis: Mayo Clinic experiences with a hitherto unnamed disease. Mayo Clin Proc. 1980 Jul. 55(7):434-8. [Medline]. Chitturi S, Farrell GC, Hashimoto E, Saibara T, Lau GK, Sollano JD. Non-alcoholic fatty liver disease in the Asia-Pacific region: definitions and overview of proposed guidelines. J Gastroenterol Hepatol. 2007 Jun. 22(6):778-87. [Medline]. Browning JD, Szczepaniak LS, Dobbins R, et al. Prevalence of hepatic steatosis in an urban population in the United States: impact of ethnicity. Hepatology. 2004 Dec. 40(6):1387-95. [Medline]. Weston SR, Leyden W, Murphy R, et al. Racial and ethnic distribution of nonalcoholic fatty liver in persons with newly diagnosed chronic liver disease. Hepatology. 2005 Feb. 41(2):372-9. [Medline]. Clark JM. The epidemiology of nonalcoholic fatty liver disease in adults. J Clin Gastroenterol. 2006 Mar. 40 Suppl 1:S5-10. [Medline]. Younossi ZM. Review article: current management of non-alcoholic fatty liver disease and non-alcoholic steatohepatitis. Aliment Pharmacol Ther. 2008 Jul. 28(1):2-12. [Medline]. Delgado JS. Evolving trends in nonalcoholic fatty liver disease. Eur J Intern Med. 2008 Mar. 19(2):75-82. [Medline]. Rinella ME. Nonalcoholic fatty liver disease: a systematic review. JAMA. 2015 Jun 9. 313(22):2263-73. [Medline]. Patton HM, Sirlin C, Behling C, Middleton M, Schwimmer JB, Lavine JE. Pediatric nonalcoholic fatty liver disease: a critical appraisal of current data and implications for future research. J Pediatr Gastroenterol Nutr. 2006 Oct. 43(4):413-27. [Medline]. Kim CH, Younossi ZM. Nonalcoholic fatty liver disease: a manifestation of the metabolic syndrome. Cleve Clin J Med. 2008 Oct. 75(10):721-8. [Medline]. Rector RS, Thyfault JP, Wei Y, Ibdah JA. Non-alcoholic fatty liver disease and the metabolic syndrome: an update. World J Gastroenterol. 2008 Jan 14. 14(2):185-92. [Medline]. [Full Text]. Jou J, Choi SS, Diehl AM. Mechanisms of disease progression in nonalcoholic fatty liver disease. Semin Liver Dis. 2008 Nov. 28(4):370-9. [Medline]. Wei Y, Rector RS, Thyfault JP, Ibdah JA. Nonalcoholic fatty liver disease and mitochondrial dysfunction. World J Gastroenterol. 2008 Jan 14. 14(2):193-9. [Medline]. [Full Text]. Alkhouri N, Berk M, Yerian L, et al. OxNASH score correlates with histologic features and severity of nonalcoholic fatty liver disease. Dig Dis Sci. 2014 Jul. 59(7):1617-24. [Medline]. [Full Text]. Palasciano G, Moschetta A, Palmieri VO, et al. Non-alcoholic fatty liver disease in the metabolic syndrome. Curr Pharm Des. 2007. 13(21):2193-8. [Medline]. Adams LA, Angulo P, Lindor KD. Nonalcoholic fatty liver disease. CMAJ. 2005 Mar 29. 172(7):899-905. [Medline]. [Full Text]. Erickson SK. Nonalcoholic fatty liver disease. J Lipid Res. 2009 Apr. 50 Suppl:S412-6. [Medline]. [Full Text]. Jiang J, Torok N. Nonalcoholic steatohepatitis and the metabolic syndrome. Metab Syndr Relat Disord. 2008 Mar. 6(1):1-7. [Medline]. Yilmaz Y, Colak Y, Kurt R, Senates E, Eren F. Linking nonalcoholic fatty liver disease to hepatocellular carcinoma: from bedside to bench and back. Tumori. 2013 Jan-Feb. 99(1):10-6. [Medline]. Careyva B, Stello B. Diabetes mellitus: management of gastrointestinal complications. Am Fam Physician. 2016 Dec 15. 94(12):980-86. [Medline]. Lindor KD, on behalf of the UDCA/NASH Study Group. Ursodeoxycholic acid for treatment of nonalcoholic steatohepatitis: results of a randomized, placebo-controlled trial [abstract]. Gastroenterology. 2003. 124(4):A708-A709. Oh MK, Winn J, Poordad F. Review article: diagnosis and treatment of non-alcoholic fatty liver disease. Aliment Pharmacol Ther. 2008 Sep 1. 28(5):503-22. [Medline]. Schwimmer JB, Behling C, Newbury R, et al. Histopathology of pediatric nonalcoholic fatty liver disease. Hepatology. 2005 Sep. 42(3):641-9. [Medline]. Tang A, Desai A, Hamilton G, et al. Accuracy of MR imaging-estimated proton density fat fraction for classification of dichotomized histologic steatosis grades in nonalcoholic fatty liver disease. Radiology. 2015 Feb. 274(2):416-25. [Medline]. Yeh MM, Brunt EM. Pathology of nonalcoholic fatty liver disease. Am J Clin Pathol. 2007 Nov. 128(5):837-47. [Medline]. Kleiner DE, Brunt EM, Van Natta M, et al. Design and validation of a histological scoring system for nonalcoholic fatty liver disease. Hepatology. 2005 Jun. 41(6):1313-21. [Medline]. Matteoni CA, Younossi ZM, Gramlich T, Boparai N, Liu YC, McCullough AJ. Nonalcoholic fatty liver disease: a spectrum of clinical and pathological severity. Gastroenterology. 1999 Jun. 116(6):1413-9. [Medline]. Brunt EM, Kleiner DE, Wilson LA, et al. Portal chronic inflammation in nonalcoholic fatty liver disease (NAFLD): a histologic marker of advanced NAFLD-Clinicopathologic correlations from the nonalcoholic steatohepatitis clinical research network. Hepatology. 2009 Mar. 49(3):809-20. [Medline]. [Full Text]. Giorgio V, Prono F, Graziano F, Nobili V. Pediatric non alcoholic fatty liver disease: old and new concepts on development, progression, metabolic insight and potential treatment targets. BMC Pediatr. 2013 Mar 25. 13:40. [Medline]. [Full Text]. Fujita N, Takei Y. Iron overload in nonalcoholic steatohepatitis. Adv Clin Chem. 2011. 55:105-32. [Medline]. Lackner C, Gogg-Kamerer M, Zatloukal K, Stumptner C, Brunt EM, Denk H. Ballooned hepatocytes in steatohepatitis: the value of keratin immunohistochemistry for diagnosis. J Hepatol. 2008 May. 48(5):821-8. [Medline]. Angulo P. Long-term mortality in nonalcoholic fatty liver disease: is liver histology of any prognostic significance?. Hepatology. 2010 Feb. 51(2):373-5. [Medline]. [Full Text]. Day CP. Natural history of NAFLD: remarkably benign in the absence of cirrhosis. Gastroenterology. 2005 Jul. 129(1):375-8. [Medline]. Ekstedt M, Franzen LE, Mathiesen UL, et al. Long-term follow-up of patients with NAFLD and elevated liver enzymes. Hepatology. 2006 Oct. 44(4):865-73. [Medline]. Larter CZ, Yeh MM, Haigh WG, et al. Dietary modification dampens liver inflammation and fibrosis in obesity-related fatty liver disease. Obesity (Silver Spring). 2013 Jun. 21(6):1189-99. [Medline]. Bondini S, Kleiner DE, Goodman ZD, Gramlich T, Younossi ZM. Pathologic assessment of non-alcoholic fatty liver disease. Clin Liver Dis. 2007 Feb. 11(1):17-23, vii. [Medline]. Brunt EM. Nonalcoholic steatohepatitis. Semin Liver Dis. 2004 Feb. 24(1):3-20. [Medline]. Brunt EM. Pathology of nonalcoholic steatohepatitis. Hepatol Res. 2005 Oct. 33(2):68-71. [Medline]. Brunt EM, Janney CG, Di Bisceglie AM, Neuschwander-Tetri BA, Bacon BR. Nonalcoholic steatohepatitis: a proposal for grading and staging the histological lesions. Am J Gastroenterol. 1999 Sep. 94(9):2467-74. [Medline]. Brunt EM, Janney CG, DiBisceglie AM, Neuschwander-Tetri BA, Bacon BR. A proposal for grading and staging the histopathological findings in nonalcoholic steatohepatitis (NASH) [abstract]. Mod Pathol. 1998. 11(1):151a. Burke A, Lucey MR. Non-alcoholic fatty liver disease, non-alcoholic steatohepatitis and orthotopic liver transplantation. Am J Transplant. 2004 May. 4(5):686-93. [Medline]. Carter-Kent C, Yerian LM, Brunt EM, et al. Nonalcoholic steatohepatitis in children: a multicenter clinicopathological study. Hepatology. 2009 Oct. 50(4):1113-20. [Medline]. [Full Text]. Charlton M, Kasparova P, Weston S, et al. Frequency of nonalcoholic steatohepatitis as a cause of advanced liver disease. Liver Transpl. 2001 Jul. 7(7):608-14. [Medline]. Contos MJ, Cales W, Sterling RK, et al. Development of nonalcoholic fatty liver disease after orthotopic liver transplantation for cryptogenic cirrhosis. Liver Transpl. 2001 Apr. 7(4):363-73. [Medline]. Czaja AJ. Recurrence of nonalcoholic steatohepatitis after liver transplantation. Liver Transpl Surg. 1997 Mar. 3(2):185-6. [Medline]. Kotlyar DS, Campbell MS, Reddy KR. Recurrence of diseases following orthotopic liver transplantation. Am J Gastroenterol. 2006 Jun. 101(6):1370-8. [Medline]. Lerret SM, Skelton JA. Pediatric nonalcoholic fatty liver disease. Gastroenterol Nurs. 2008 Mar-Apr. 31(2):115-9. [Medline]. Ong J, Younossi ZM, Reddy V, et al. Cryptogenic cirrhosis and posttransplantation nonalcoholic fatty liver disease. Liver Transpl. 2001 Sep. 7(9):797-801. [Medline]. Rafiq N, Younossi ZM. Effects of weight loss on nonalcoholic fatty liver disease. Semin Liver Dis. 2008 Nov. 28(4):427-33. [Medline]. Seo S, Maganti K, Khehra M, et al. De novo nonalcoholic fatty liver disease after liver transplantation. Liver Transpl. 2007 Jun. 13(6):844-7. [Medline]. Wiesner RH, Menon KV. Late hepatic allograft dysfunction. Liver Transpl. 2001 Nov. 7(11 Suppl 1):S60-73. [Medline]. Xanthakos S, Miles L, Bucuvalas J, Daniels S, Garcia V, Inge T. Histologic spectrum of nonalcoholic fatty liver disease in morbidly obese adolescents. Clin Gastroenterol Hepatol. 2006 Feb. 4(2):226-32. [Medline]. Sakamoto M, Tsujikawa H, Effendi K, et al. Pathological findings of nonalcoholic steatohepatitis and nonalcoholic fatty liver disease. Pathol Int. 2017 Jan. 67(1):1-7. [Medline]. Magee N, Zou A, Zhang Y. Pathogenesis of nonalcoholic steatohepatitis: interactions between liver parenchymal and nonparenchymal cells. Biomed Res Int. 2016. 2016:5170402. [Medline].